LAB 3 : COMBINATIONAL SYSTEM DESIGN USING BEHAVIOR MODELLING STYLE. Lab Exercise 3 : VHDL with Naresh Singh Dobal Learning Series. Lab Exercise 3-b :: VHDL with Naresh Singh Dobal Learning Series. Task1 : Write a VHDL code for Full adder using if-else. Task2: Write a VHDL code for Full subtractor using if-else. Task3: Write a VHDL code for 4:1 Multiplexer using if-else. Task4: Write a VHDL code for 1:4 Demultiplexer using if-else. Task5: Write a VHDL code for a 8:3 Encoder using if-else. Task6: Write a VHDL code for a 3:8 Decoder using if-else. Task7: Write a VHDL code for Full adder using case. Task8 : Write a VHDL code for Full subtractor using case. Task9: Write a VHDL code for 4:1 Multiplexer using case. Task10: Write a VHDL code for 1:4 Demultiplexer using case. Task11: Write a VHDL code for 8:3 Encoder using case. 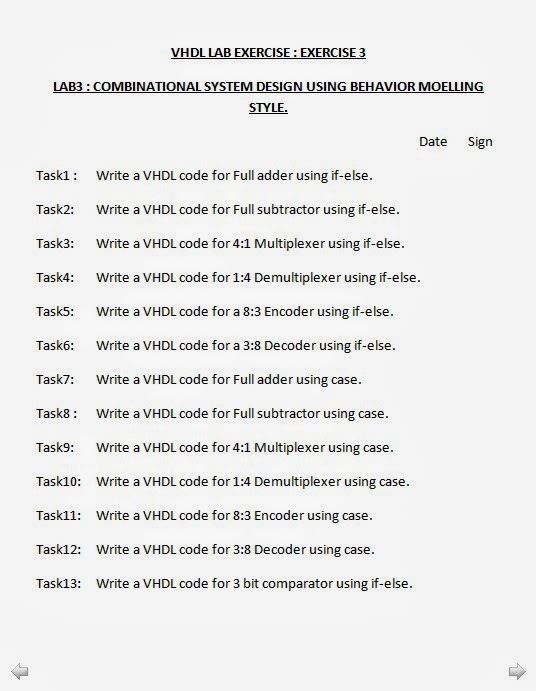 Task12: Write a VHDL code for 3:8 Decoder using case. Task13: Write a VHDL code for 3 bit comparator using if-else. Task14: Write a VHDL code for BINARY TO GRAY converter using if-else. 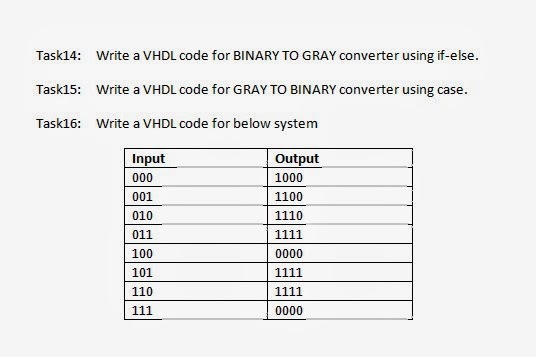 Task15: Write a VHDL code for GRAY TO BINARY converter using case.